I love a correctly baked banana bread! I am picky about banana breads! I only use the one same recipe that I always get compliment on! I honestly got it from allrecipes.com! The only difference I did was I added chocolate chips and sometimes substitute the sour cream with greek yoghurt! It’s healthier! Also, if I don’t have an overripe bananas at home, I bake them in a pan in an oven for about 15 minutes at 375. This will make the bananas caramelized and intensify its flavor. One last thing I learnt in a cooking class is that when you are mixing nuts into a batter, most recipes instructs to put it last: however putting it in the beginning will actually make the nuts release its flavor and making the bread taste better! So that’s what I always do now! I am going to post the link to the recipe here. Preheat oven to 350 degrees F (175 degrees C). Grease a 9×5 inch loaf pan. In a large bowl, stir together the melted butter and sugar. Add the eggs and vanilla, mix well. Combine the flour, baking soda, walnuts and salt, stir into the butter mixture until smooth. Finally, fold in the sour cream, and bananas and chocolate chips. Spread evenly into the prepared pan. Bake at 350 degrees F (175 degrees C) for 60 minutes, or until a toothpick inserted into the center of the loaf comes out clean. Cool loaf in the pan for 10 minutes before removing to a wire rack to cool completely. The Gulbeden family household has been going through a change lately, and I’m excited! Although how it starts is not as exciting. The change began after a “this-is-enough!” moment. I wish I could lie but in reality it’s at times hard to keep up with housework- especially with a 2 year old toddler that’s messing up whatever you just cleaned and leaving a trail of crumbs and toys everywhere. And laundry….urgh don’t even talk to me about laundry! It’s a bottomless pit! Dirty dishes seems endless too! It’s a mess- which leads to frustration, and stress at times. One morning, Hubster woke up in frustration because Nunu’s room was messy. Yelling and arguing was exchanged between him and Nunu- with Nunu ended up crying. In response to this, I got angry at hubster for making Nunu cry and I don’t like making kids stress out before school fearing it might influence his studies at school. We ended up blaming each other for not doing any of our chores. On top of that we couldn’t find the car keys anywhere, and Little Lala wasn’t letting me make Nunu’s lunch. Plus, after they left for school, I remembered that we had forgotten to come to school for a teacher meeting that morning. Children can sense when we are out of control. Research says children number one want is less stress. Prepare our children to enter the world. What do families do right? And make it happier? Family meeting- increase communication, decrease stress. 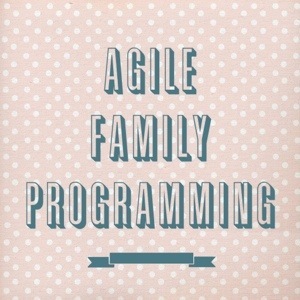 Agile management becomes a family programming – everybody is accountable. There’s power in morning checklist. Ask kids for punishment e.g: Lose dessert for a month. 2. Empower your kids. E.g: over reacting. Give 3 minutes of it. If more, give punishment- 1 push up. Reward when achieved. Children who plan their own goal build their frontal cortex and success more in life. Preserve the core- define your mission- make family mission statements. These are answers to the question:What’s important to us? For example: Travelers not tourists. We don’t like dilemmas we like solution. Bring people together. Great to point what it is we do right. Tell where you come from, where grandpa comes from. Children who have a sense of who they are has a bigger self-confidence. Happiness is not something we find but something we make. Greatness is not a matter of chance it’s a matter of choice. Secret of happy family? Try! After researching more on Agile family programming, I decided to give family meetings a try. I talked to my husband on doing it as a routine every week. We decided to do it every Monday, and agreed that throughout the rest of the week, there will be no yelling! Instead, we will call out an emergency family meeting! We have been doing this Agile program for a couple of weeks and I can finally say that our house is cleaner and happier! It’s also good for the kids since they also learn leadership values- how to conduct meetings, how to express frustration in a calm way with everybody sitting down ready to listen, and it also teaches them responsibilities. how much wood can a woodpecker peck, if a woodpecker could peck wood? – how to get rid woodpeckers! Okay, sorry for the title, I might seem crazy but we were almost going crazy last two weeks, and had to tell y’all! So one saturday morning, I was drowsy and decided to sleep again after praying fajr and was expecting a nice nap. But then suddenly this horrible noise woke me up! It reminded me of the sound when there were roofers nailing new shingles on the roof! 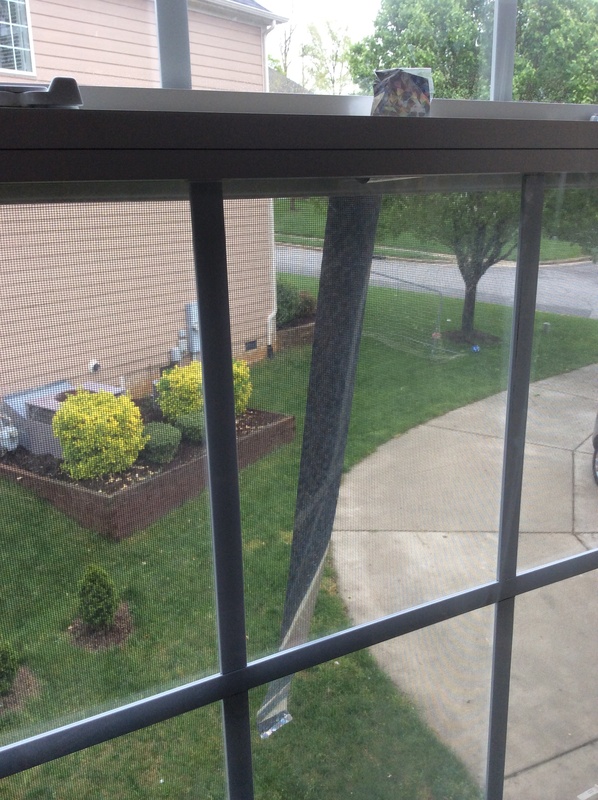 drrrrrrdd…drrrrddd….it kept on pecking beside our master bedroom and it stopped. I thought that was it! but then the next morning, same time, it was pecking again! and this time it was more then once! Hubster ran outside and shoed them off. and the next day, it came pecking again, only this time, it’s at the same time of morning (it’s amazing how even birds have a schedule in their life! I’m inspired! lol) and also 5 other times during the day and at different spots of the house! My house was like it was under attack!!! It was horrible! and little Lala was so scared of the noise she cried everytime and “topp…toooopp” (for stop). Hubster was determined to end it. We had so much hopes it would work! He took his tall ladders and put it all over the roof and anywhere he thought the woodpeckers would be. and amazingly, it worked! The ribbon flutters and flies with the wind and scares off the woodpeckers! It’s been 3 days and no pecking! A happy family with happy sleepers now! Yayy! Spring is in the air! Spring is my utmost favorite season! Birds starts singing, cute green plant buds peeking out, the perfect fresh warm breeze, and the end of winter (don’t.like.winter!) But most of all, the lovely tulips are out. I love love love tulips- in any color and size. 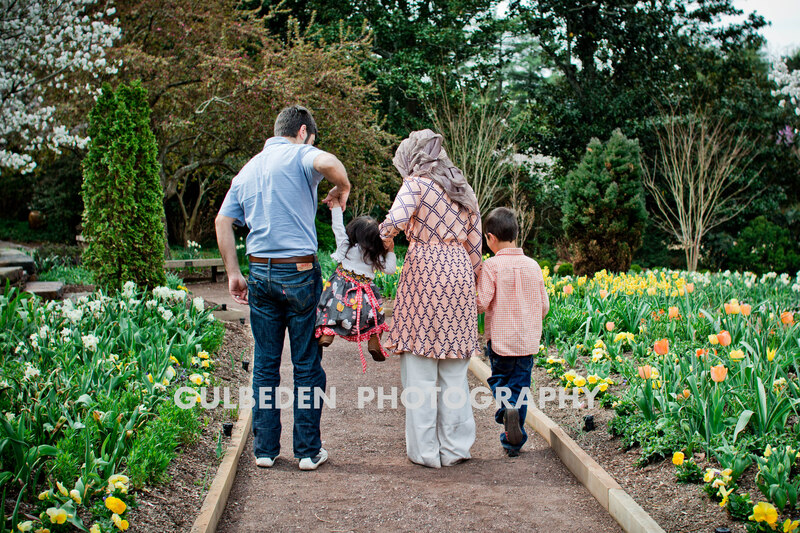 Every year, we go to Duke Garden in Durham, NC, to visit their tulips and take a gazillion pictures. This is the second or third week the tulips are out, and I have been to Duke Garden every week! If only it wasn’t 35 minutes away from my home, I would have been there every day! We also met a friend there, Saida, and had a great time. I was trying to sharpen my photography skills and she helped me to be my victim haha. I was experimenting different apertures and camera settings on her, because all of my other family members are tired being my victim lol…. After being done fascinated with the tulips, we went by the grassy area by the beautiful pond with cute little ducks swimming in it. We opened our blankets and had a little picnic/snack there. She came with her husband and two kids which are Nunu’s age- 6 and 7. So Yunus definitely had a blast playing with them. They climbed trees (the kids and the husbands, yes the husbands too lol) , played frisbees, and the kids made boats out of magnolia tree leaves. Since I was talking about how we evolve in my previous post, it’s funny because in some sense I was still the same person that love to think positively about life. I just had to share this post of mine in another untouched blog that I have dated dated January 5th, 2005 because it’s something I always want to be reminded of. My Mom told me today that at times we are lika a fish…. When I was driving to Chicago today to buy our monthly Indonesian grocery, me and my mom were talking about one of our neighborX, that was stressed out because she lost her job , and couldn’t find a job anywhere. X was so depressed that since a year ago, she stayed at home in front of the TV and fed herself until she gained more than 50 pounds!. X’s mom cried and told my mom how her daughter only lives only to breath, does not believe in God anymore, and that X is losing her mind and also her health. Why does all this have to happen only because of a job?.X is not only ruining herself, but also ruining her mother, her father, and everyone by acting that way. My mom told me today that at times we are like a fish…. Why? Because when we try to catch a fish to move it to another bowl, they go berserk and struggle as hard as they can to be loose; not knowing that we are actully moving them to another place that is bigger, cleaner, and nicer than the old bowl. The angry fish’s atittitude is similar like what most of us will do when God give us a test and trial. We cry, complain, get depressed and angry, denying the fact of the reality; where He actually could be doing us a favor of putting us to a better situation. In short, what we need to remember is that we do not know what Our Creator actually has for us. Maybe He’s not giving us what we want, not because He hates us, but because He loves us and that it is good for us in the long run. We might not know, and feel a deep pain at that moment, but believe and have trust in Him. Don’t loose hope in Him and keep on praying to Him as He is the Best of Planner. May Allah gives us all a big heart full of patience, and make everything easy for us. Amin. So….it’s 2014. Four years since the last time I even posted anything in this site. I can’t believe I never did anything in this beloved website of mine. I almost even forgot it even existed until I met a friend of mine that have a blog and it reminded me I ever had one. I guess being busy with two kids (this is probably only an excuse haha), I had no extra time to write or update anything. Although, I would say I have a happy life, alhamdulillah, the person that I was in 2009 is definitely different than who I am today. Our family is also evolving. That’s why I realized I need this blog. I need to write. Not just recipes, but also different things. Preserve the memories. I need to share what I learnt, what I love, crafts I did, etc. – cook lots of crushed garlic (maybe 12 cloves), and cubed tomatoes (around 6 roma tomatoes). Keep on cooking until it becomes a sauce. – Yoghurt mixed with fresh crushed garlic. 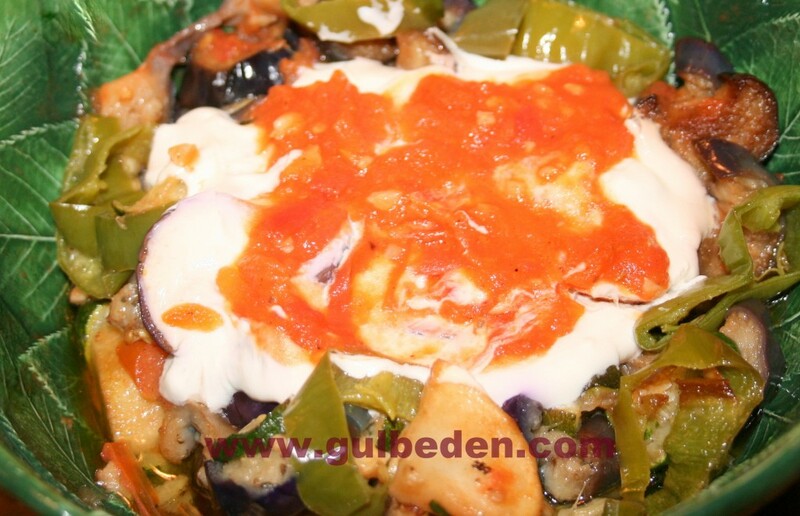 – how to serve: layer all the fried veggies, and then the yoghurt mix, and then the sauce. Bon appetit! This serving is for 90 people, so measure accordingly to how many guests you will have, but usually, with this drink, one guest will probably chug many servings. Combine water and frozen concentrated. Stir to dissolve. Stir in pinapple juice, sugar, and lime. Stir to dissolve sugar. Leave in fridge. 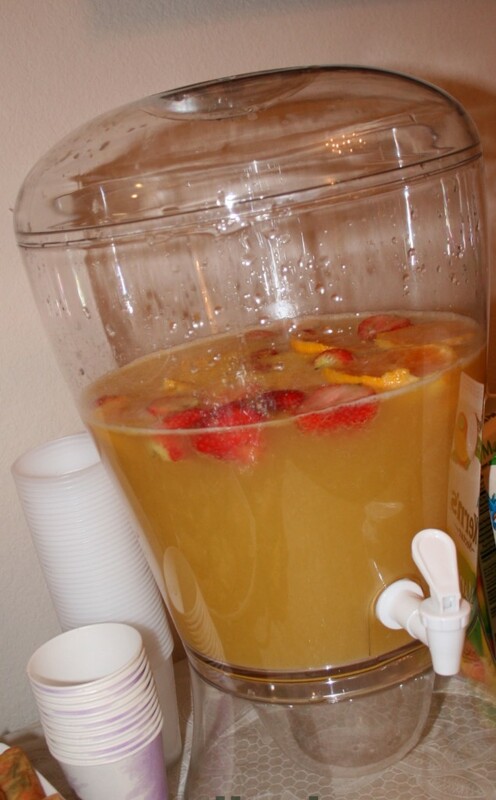 When ready to serve, pour half of mixture of juice over ice in a large punch bowl. Slowly pur in 2 bottles of ginger ale and 1 bottle of carbonated water. Stir gently to mix. This dessert taste as good as baklava. I love the walnuts surprise inside the cookies when I first ate it, and the moist texture of the cookie, just makes this cookie absolutely irresistible to eat. First, prepare the syrup. Combine sugar and water in a pot to boil for 10 minutes, and then add the lemon juice. Set aside and cool down in the fridge. The dough: Mix butter, flour, yoghurt, vegetable oi;, 1 egg, baking powder in a bowl and knead well with your hand. Cover the bowl with damp kitchen towel and let it sit for 10 minutes or so. After 10 minutes, take some of the dough, and make a flat circle, add a walnut in the middle, fold, seal, and shape it like the picture above. Then, with a grater, touch the top of the dough lightly that it makes a nice indentation. After all the dough have been inserted and shaped, bake them for 350 degrees celcius for 10-15 minutes, and then at 375 degrees, top shelf, until golden brown. Take it off the oven, and pour the cold syrup all over it. Leave it that way, until the cookie absorb the syrup. 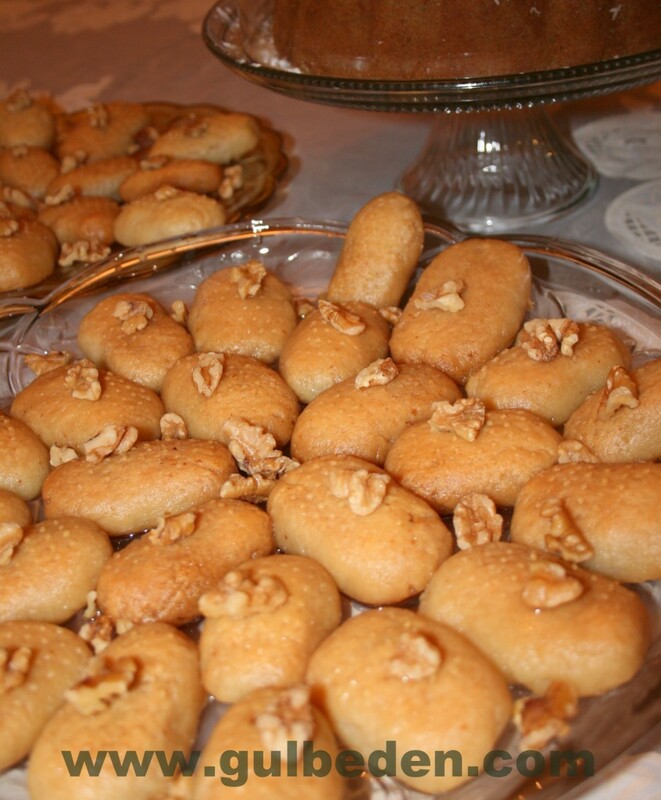 Whenever I make these cookies to a gathering, they always ask for the recipe! mix this all together nicely, and then add 1 tsp baking powder. mix again. divide into 12 balls. 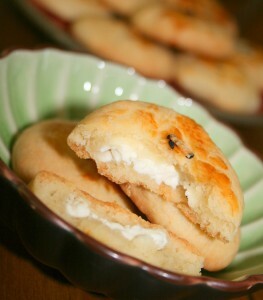 and then make hole in the inside and insert cream cheese or feta cheese. I like feta cheese more. p.s: This dough is good for anything, instead of cheese, cooked ground beef/chicken with onions, or mashed potatoes with seasonings will also taste good.